This week my inner artist was screaming for supplies, but I decided that even though I went to find the list of items needed, I wouldn’t settle for less than a magical date. I decided to go down to the shops in Old Town Battle Ground to see what was new. I parked my car at one end of the strip and planned to walk down one side of the street and back up the other. 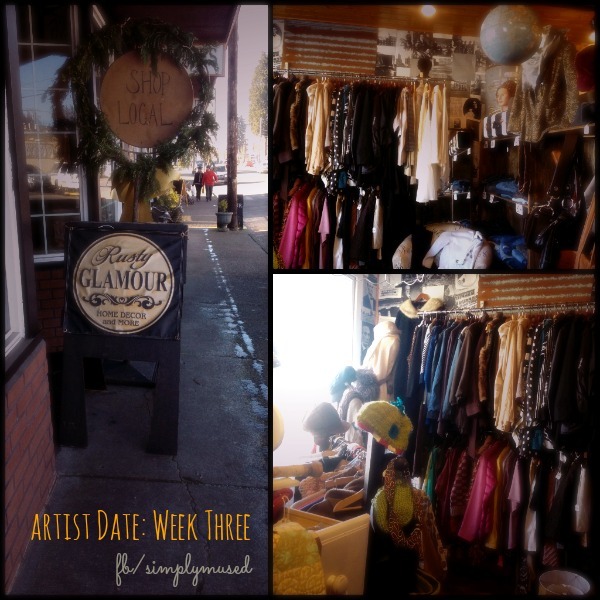 I didn’t get far before finding a great vintage shop called Rusty Glamour. I hadn’t been shopping for old/new finds for quite some time, so coming to the vintage clothing section was a pleasant surprise. They had unique pieces of clothing perfect for any one with a sense of style. I found a flowing skirt and a couple of scarves so reasonably priced that I couldn’t leave without them. If the other pieces that I loved had been my size I would have went home with a lot more. My inner artist has been nagging at me due to how drab and boring my own wardrobe is, so how wonderful it is to have found a little shop that has a fresh idea, yet is affordably priced. I got a skirt and two scarves for only $30. To me these were a bargain. How often when you go looking for a bargain you find stuff that looks like it was a bargain? This wasn’t the case for me today. I expected the prices to be much higher on each item. I ran into an old friend and caught up with her for several minutes until her daughter started getting impatient. The cashier/owner was also more than helpful and gave me the rundown on all of the other vintage/antique shops in town. She didn’t mind me taking a picture of my favorite corner of her shop either. It is a great feeling to have a clerk that is not rushed and is there to connect for a moment as a fellow person (something that department stores or online shopping cannot and will not offer). Something that I realized after my time walking up the old section of town is that I am a country girl at heart. I love the feeling of being connected with the people and the spirit of the community. I also love the products and essence of what comes from that area. Those country finds help me remember where I come from and what makes me unique. This entry was posted in Artist's Date and tagged art, country, creative, creativity, heart, the artist's date, vintage, writing. Bookmark the permalink.